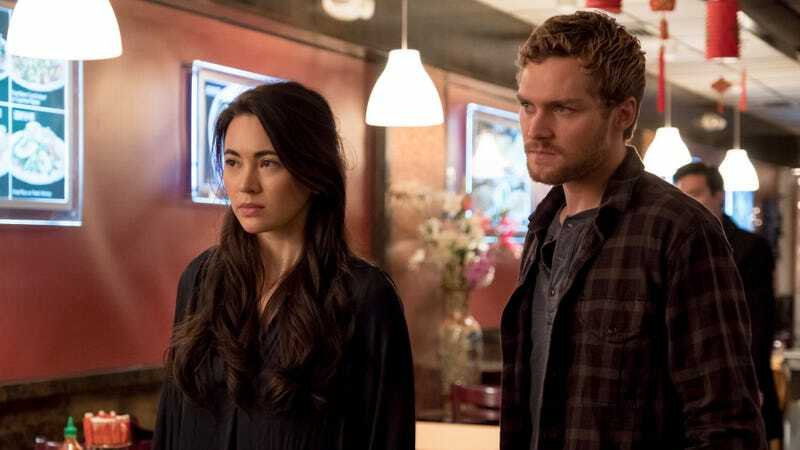 Jessica Henwick as Colleen Wing and Finn Jones as Danny Rand in Iron FIst’s second season. There are a number of reasons why the first season of Iron Fist was met with an almost universally negative response, the two most important being that it was both racially insensitive and narratively boring, a losing combination. It’s fair to say that Iron Fist began as a show about a privileged white kung fu master going on a lifeless hero’s journey and beating up a bunch of nondescript people of color conveniently typecast as ninjas and monks along the way. While there’s no undoing the past, Iron Fist has the opportunity in its second season to reintroduce everyone to Danny Rand post-Defenders, and potentially put him in a position to be the sort of character whose adventures you actually want to follow. In the past, it’s felt like Netflix hasn’t quite known what kind of person it wants Danny to be. He’s an outsider caught between worlds, but he also has an outsized amount of confidence in himself—two aspects of his personality which are at odds in a way that made it difficult to get a read on his character. He’s a world-weary traveler who’s seen things that most people couldn’t imagine, but he’s also the Defenders’ dorky kid brother who needs to be told to take his feet off people’s furniture. Being forced to learn how to adapt when presented with new information in unfamiliar environments is the essence of Iron Fist’s origin story, and it’s something that Iron Fist should continue to emphasize about the character. Even though the MCU’s Danny has already become the Iron Fist, he’s still a long way from being a wise man of the world—in no small part because he spent the bulk of his life in a parallel dimension away from normal society. Technically speaking, Danny’s still very new to the world even though he’s been back from K’un-Lun for a bit of time now, and it makes sense that a big part of his continued education would be tied to his interactions with the other people in his orbit like Coleen Wing and Misty Knight. Though Matt Murdock isn’t likely to make an on-screen appearance in the new season, his interactions with Iron Fist during The Defenders play a large role in shaping Danny’s motivations as he moves forward. With Daredevil missing in action, Danny takes it upon himself to defend the streets of Hells Kitchen and beyond since the NYPD can’t or won’t. Again, though, as noble as his intentions are (and as lovely a way as that is to tie Iron Fist to another series), Danny doesn’t really know this New York City as it exists today. If he wants to fill the space that Daredevil—a man who lived in New York for his entire life—has left behind, he needs to learn what it means to be someone who can move through the city deftly and with purpose.